Note: size, package can be customized. Color: (red,yellow,dark blue)three color combination. To add more fun, a vocal is inserted in the cushion, it will make interesting squeak when jumping. 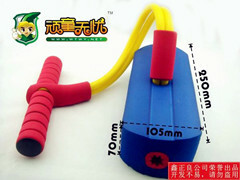 1)The yellow part is TPR tube which has good elasticity and bear load, what's more, we doubled the tpr tube to ensure kids safety. 2)To add more fun, a vocal device is insert to the cushion, every jump will makes exciting squeak. If you are interested in this kids jumping toy, please feel free to contact me.